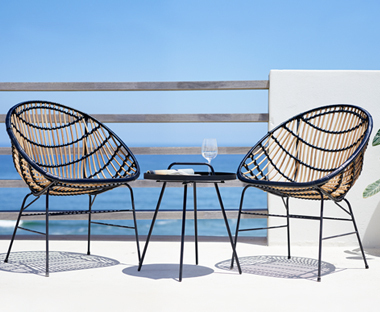 Explore our large selection of garden furniture and find what is essential to your specific taste. At JYSK you will find garden tables and chairs, comfortable lounge sets and bistro sets in FSC hardwood, aluminum and polyrattan. If you need new garden cushions, you will find a large variety in different shapes and colours. Spring and Summer are synonymous with long days spent outdoors, and many of us also enjoy eating and dining in the sun. Therefore having quality garden furniture is a must. Is it time to replace your old garden table and chairs? 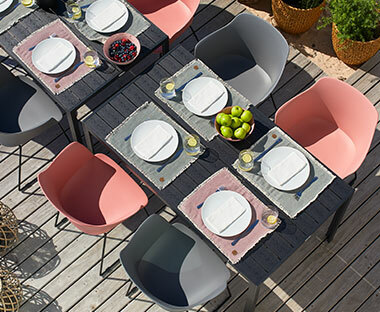 Prepare your outdoor space with inspirational ideas and new-season looks from JYSK. Our extensive range of garden furniture ensures we have the perfect offering for all types of gardens, patios and balconies. Choose from garden benches, garden parasols, garden sofas and so much more! At JYSK we have garden furniture that is functional and combines comfort with style to match your taste. Our range varies from luxury garden furniture in hardwood to affordable and maintenance free sets, to popular rattan garden furniture. JUTLANDIA® is JYSK's own range of quality garden furniture. The JUTLANDIA range consists of a variety of garden furniture in many different materials. We are proud of the fact that most of our wooden garden furniture is sourced from FSC® certified forests. This assures you that the wood in our furniture is made with respect for nature, animals and people. In 1999 we were co-founder of The Forest Trust which works to promote FSC-certified forestry. Get more out of summer, with the right choice of garden furniture. Garden furniture is available in many different materials that may be confusingly similar. 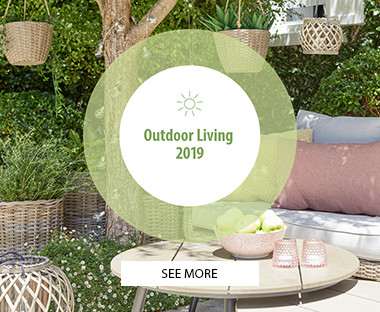 In this guide you will gain insight into what you should pay attention to and what options you have, so you can make the right choice when you need to buy new outdoor furniture. When it comes to an outdoor space, it can often be the accessories and the little details that can turn a plain garden into a magnificent one! Get inspiration and accessorising ideas with our 5 favourite garden accessories. Why go out when you can create the perfect outdoor party on your own balcony or patio? Read on for inspiration to style your outdoor space perfect for those long summer nights. Revamp your patio with these new garden trends and make your garden patio a place of luxury outdoor dining. Read on for inspiration.